Time, Money, Ambition: Inside China's Bid For Global Soccer Power : The Two-Way China's Super League is signing international stars for huge sums. Given government interest, investor enthusiasm and an enormous potential fan base, could Chinese soccer be the sport's next force? 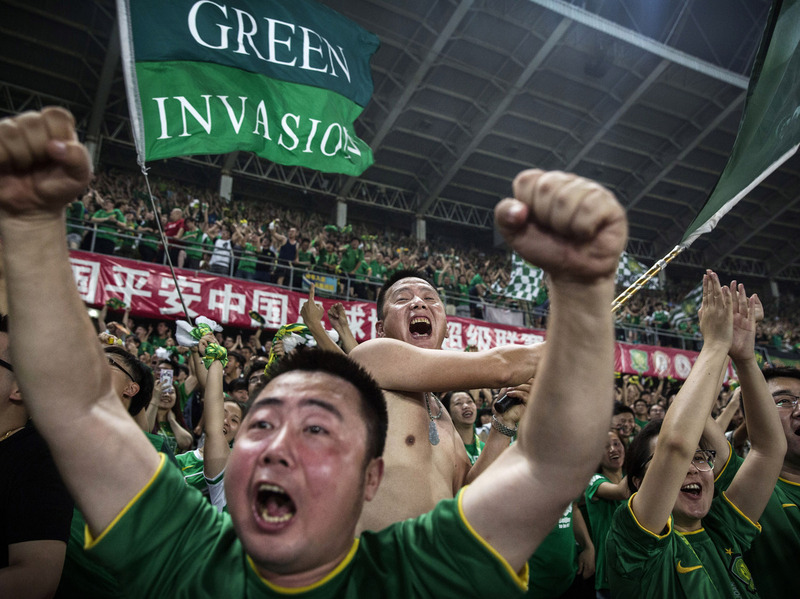 Fans of Chinese Super League club Beijing Guoan celebrate after a goal against Chongqing Lifan on June 28, 2015. In 2009, pro soccer player Lyle Martin was playing for the Vancouver White Caps, in a North American league below Major League Soccer, when he got talking with a teammate about his future. The teammate introduced him to an agent who floated the idea of playing in China. "I was like, 'China?!'" Martin says. "Are we talking about the same place?" At the time, the Chinese Super League barely registered as a blip on global soccer radar and no American had ever played professionally in the league. But Martin wanted to make more money, and CSL teams were cutting much bigger checks. So he signed with one and moved to China in 2010. "I was getting a very good salary in comparison to major league players over here," Martin said. "In bonuses alone, maybe in a month or two months, I could make more than I made playing in the [United Soccer League] for two or three years." The CSL — which just kicked off its season — is now signing international stars for enormous sums, and the world is taking notice. Last month, CSL team Jiangsu Suning outbid storied English Premiere League club Liverpool to sign Brazilian striker Alex Teixiera. Asked about the transfer, Liverpool manager Jurgen Klopp said: "People in football talk about the financial power of England because of the television contract and things like this, and now maybe [China] is another competitor." In fact, the Chinese Super League smashed its transfer-fee record several times this winter. Brazilian midfielder Alex Teixeira is welcomed to China on Feb. 13 after signing a four-year contract with Chinese Super League club Jiangsu Suning. In late January, Jiangsu Suning paid $31 million to sign former Chelsea midfielder Ramires. A week later, a different Chinese team, Guangzhou Evergrande, dropped $46 million to sign Jackson Martinez from Spanish club giant Atlético Madrid. And when Jiangsu Suning signed Teixiera for a breathtaking $55 million, the soccer world's collective jaw hit the floor. "When I was over there, they were spending at that time — I thought — a ton of money," says Martin, who played in China from 2010-11. "But when I see it now, it's just like, 'Well, I guess they were spending peanuts before.' "
During this season's winter transfer window, the CSL spent about $65 million more than the English Premiere League, which perennially trumps spending by the other four top European leagues: Spain's La Liga, Germany's Bundesliga, Italy's Serie A and France's Ligue 1. The wave of huge spending is China's latest step in its bid to become a global soccer power. With the backing of President Xi Jinping, an avowed soccer fan, and no shortage of investment money, the country has the political will and naked ambition to propel soccer into a starring role on the world stage. Last year, Xi announced a 50-point plan to overhaul all levels of soccer and help revitalize the "Chinese Dream" — which Xi says is to build a "moderately prosperous society in all respects" and realize China's "ascendance to military, economic, and cultural power." A robust soccer culture in China, the thinking goes, could help marshal national pride, serve as a soft-power tool in Chinese diplomacy and rev the country's economic engine. According to Forbes, China wants to nearly double the portion of its GDP coming from sports, which lags the U.S. and many other countries. Consulting firm PwC has estimated total revenues from 2015 ticketing, media rights, sponsorship and merchandising in China to be $3.4 billion. By comparison, the U.S. figure was $63.6 billion. Spurred on by the government, Chinese investors are opening their wallets to kickstart growth both domestically and internationally. 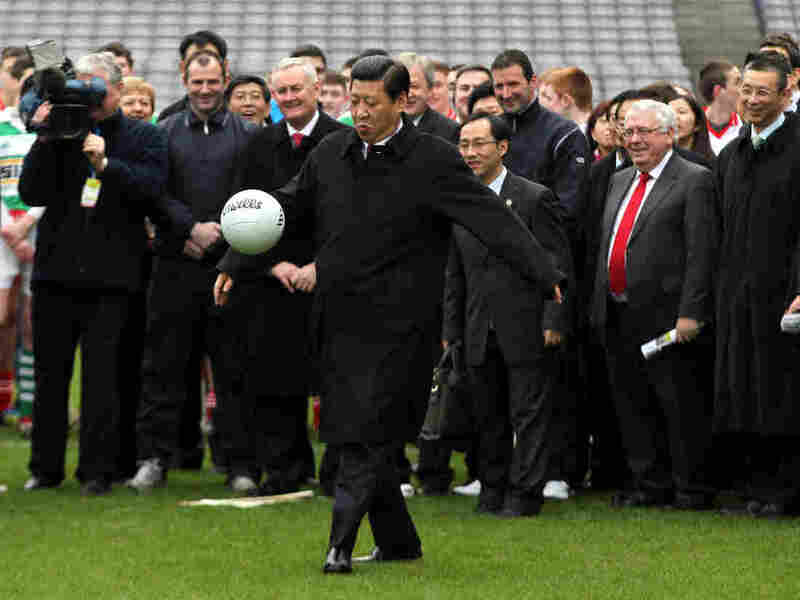 Xi Jinping, an avowed soccer fan, kicks a Gaelic football during a 2012 trip to Dublin when he was China's vice president. Xi became president the following year. Last October, the state-backed investment firm China Media Capital bought exclusive five-year broadcast rights to the CSL for about $250 million per year. That sum pales in comparison to the $7 billion-plus broadcasters paid for rights to the current English Premiere League season, but dwarfs U.S. broadcasters' $75 million-a-year deal with Major League Soccer. Investment in club ownership, too, has increased. In 2014, Alibaba Group Holding, owned by Chinese billionaire Jack Ma, bought a 50 percent stake in Guangzhou Evergrande for $192 million. (It now owns about 40 percent.) Last year, Chinese billionaire Wang Jianlin, who owns the real estate company Dalian Wanda, bought a 20 percent stake in Atlético Madrid for $52 million, with the stated intention of using the connection to improve Chinese soccer. "This investment will not only provide a golden opportunity for young Chinese players sent overseas by Wanda to be selected by leading European football clubs, it will also strengthen the quality of Chinese football and narrow the gap between the rest of the world," Wang said in a statement. Despite the recent fervor around Chinese soccer, the professional game in China isn't new. China's first pro league was established in 1994 — just a year after the MLS began in the U.S. — and transitioned into its current format, the 16-team Super League, in 2004. John Duerden, a South Korea-based British journalist who has been writing about Asian soccer since 2002, says soccer has always been a major sport in China. "One misconception is that it's come from nothing. ... It was always a decent Asian league, decent standing with quite reasonable attendances," Duerden says. "Chinese football has a long history, and there is a love of the game." Just ask Liu Qiang, a 35-year-old manager in the entertainment industry who lives in Beijing and says he has been following both Chinese soccer and European leagues since he was a teenager. "Of course my favorite [team] is Beijing Guoan," he says, referring to the city's Super League club. "I mainly watch the Premier League. It is better organized and has more high-profile players. But in terms of soccer culture, Guoan is irreplaceable in my mind. Because it's from my hometown." Liu bought season tickets last year and describes the stadium atmosphere as "overwhelming." Lyle Martin, who now lives in California with his family, said playing in China was a challenge, but he called it a once-in-a-lifetime opportunity and would do it again "in a heartbeat." "In the middle of the game," he says, "fans will jump up and down, yelling to show support. We call it 'unbeatable home court.' "
Martin, who is still the only American to have played in the Super League, says he was blown away by the fan support. "When we would go to training sessions, there would be anywhere from 8,000 to 10,000 people watching. ... For me, it was a shock at first; I'm not used to that, people don't recognize me," he says. "I never thought of myself as a star in the game. I was just always a player that worked hard. ... They would always want to take pictures and get autographs — the fans were beyond great." As for the game itself, Martin says his Chinese counterparts weren't as strong or fast as the U.S. players he was used to facing, but calls them "technical geniuses." Fans in China, too, note the difference between the level of play in the Super League and in the top European Leagues they watch. One of them is Liu Yang, a 36-year-old designer and program organizer in Beijing who follows the EPL, La Liga and CSL. He says the Chinese league is "less exciting" compared with the five big leagues in Europe. "European leagues are more confrontational, more skillful in passing. The Super League is weaker in this regard," he says. Still, he says he enjoys the CSL and supports two of its clubs. "One is Beijing Guoan. I'm a Beijinger, so of course I support our own soccer club. Another team is Guangzhou Evergrande because they've been doing great for the past few years," he says. 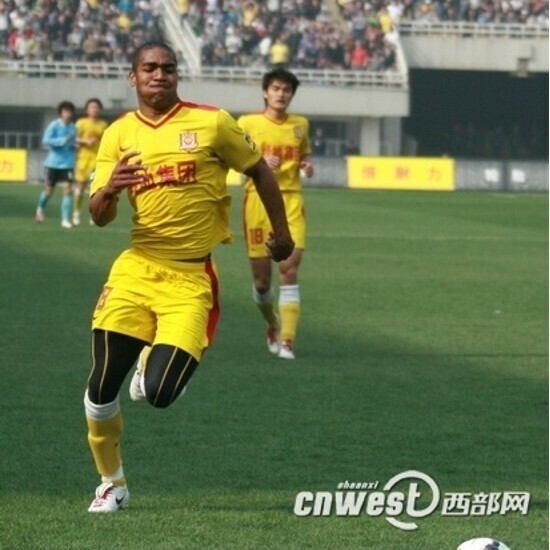 Much of Guangzhou Evergrande's success is due to the fact that it was the first CSL club to really spend big. It had been relegated to a lower league in 2010 as punishment for match-fixing, Duerden says. But the club got a new investor, Evergrande Real Estate Group, and climbed back to the top of the table, winning the country's first Asian Football Confederation Champions League title in 2013. 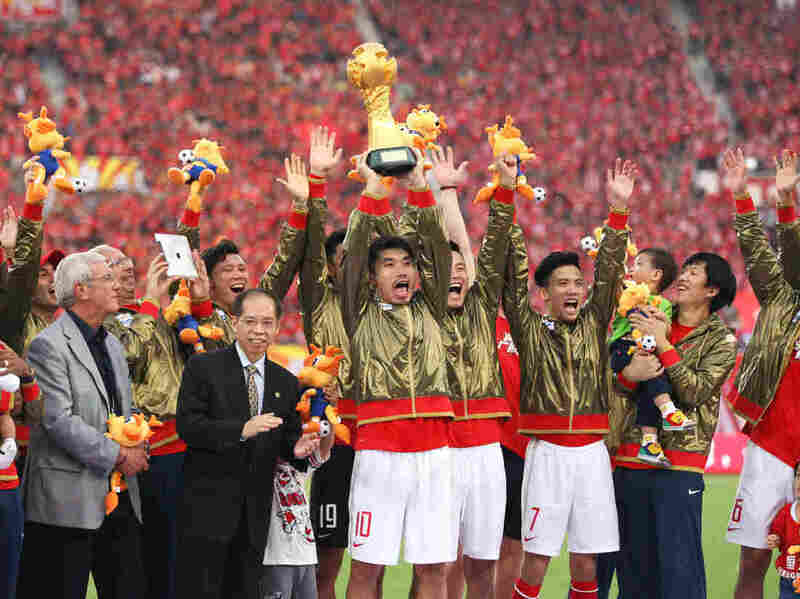 Guangzhou Evergrande players celebrate after winning the 2013 Chinese Super League title. The club has won the last five titles. "At the moment, people write about the political will to see that China becomes a world power in football, which obviously is part of it," Duerden says, "but you see teams now who want to catch the champions and win things themselves, so it's a competition domestically to get better and better players." Li Jianning, a 31-year-old program planner in Beijing, says signing talented foreign players "brings immediate effect for Chinese clubs." He says, "It helps to present more competitive games and therefore attracts more audience." Both Liu Yang and Liu Qiang agree, saying skilled foreigners help elevate local players and build both the fan base and global brand awareness of the Chinese Super League. In the U.S., Major League Soccer is banking on a similar strategy by signing players such as Didier Drogba, David Villa, Kaká and Andrea Pirlo. But to field a championship club team in China (and eventually a strong national team), it's clear that the CSL must focus on improving Chinese players. In the Super League, only four players from non-Asian countries per team are permitted to be on the field at any given time to ensure that domestic players have enough opportunities to develop. This, Duerden says, is the "key to everything." "Of course, the ultimate aim is to do well on the international level with national teams in the Asian cups and then the World Cups, and not only qualify for World Cups, but ... ultimately win them," he says. "But this is going to take time." 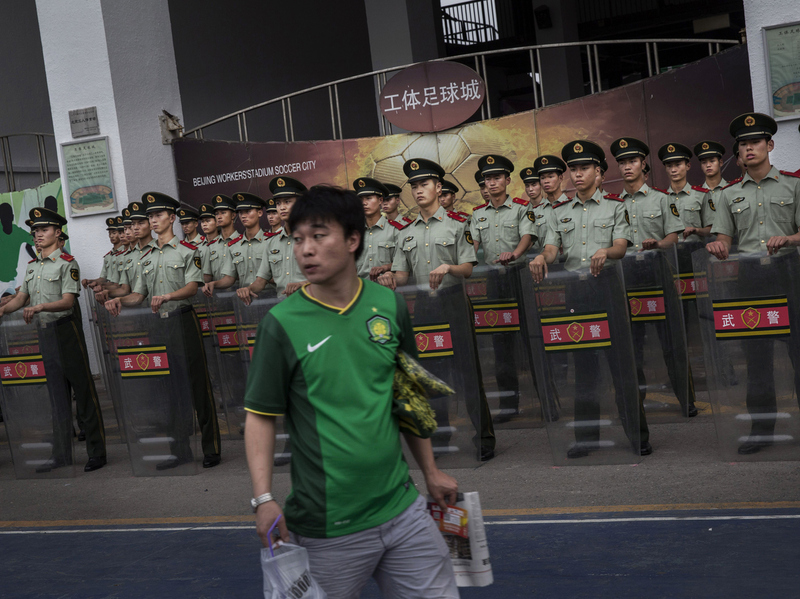 A Beijing Guoan supporter passes police officers before a match in 2015. The Chinese government hopes to transform China into a soccer power by mandating soccer programs in schools and investing in the Super League. Given the government interest, investor enthusiasm and the country's potential fan base of nearly 1.4 billion people, the global success of Chinese soccer might seem inevitable. But it's all a matter of perspective — just ask the fans. "I think we've already have a world-class club now: Guangzhou Evergrande," Li Jianning says, citing the club's No. 40 world ranking in 2013, which put it above a number of European clubs. Liu Yang says evaluating the future of Chinese soccer is about managing expectations: "The Super League is way weaker [than European leagues]. I believe it has the potential to be the best in Asia, but when it comes to worldwide, it's not practical." But Liu Qiang thinks China's passion for the game will help propel its rise internationally. "I think it's because since a long time ago, Chinese people all share this dream about Chinese soccer, which is 'Go beyond Asia, Take on the world!'" Beijing-based NPR News Assistant Liang Ruixue contributed to this report.